J.D. Vance, is the author of the bestseller, Hillbilly Elegy: A Memoir of a Family and Culture in Crisis. Before the reader even opens the cover, the book’’s alliterative title grabs you. The timing of its release was prescient, as it coincided with Donald Trump’s campaign theme to “Make America Great Again.” To a large extent, the people Vance writes about—hillbillies and small town folks who think mainstream America has forgotten about them—are the choir to whom Trump preaches. With President Trump’s march to the White House, we’ve learned just how restive and divided we are as a nation. Much of the discontent centers on a population Vance knows well—his friends and family members. They and others born in Appalachia moved from the Kentucky hills to towns and cities in Ohio. In the process, these folks brought their culture and customs with them, including a tradition of hard work, rough manners, and coarse, tell-it-as-it-is language, but also generational poverty, lack of education, and drug addition. 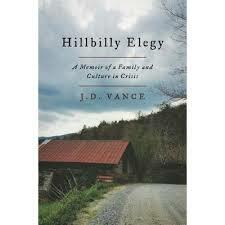 Throughout the book, Vance articulates his love for family and his fellow hillbillies. He’s as candid about their faults as he is about his difficult childhood. He constantly moved from place to place, while living off and on with a drug addicted mother, and different father figures, until his grandparents took him in. One of the helpful ways Vance ushers outsiders into this culture is through the use of language. For instance, he tells us that if you catch a minna, you’ve snagged a minnow. A hollow, for those who don’t know, is a deep valley, although Vance says he never used the word hollow, except when explaining the difference between hollow and holler. One of Vance’s first jobs as a teenager was a cashier in a grocery store that served both poor and more well-off customers. One day he asked his grandmother why only poor people bought baby formula. She told him that poor people don’t breast feed. That’s an interesting tidbit, but, I’d have preferred to hear from a mother or two, why breastfeeding is a no-no. In another soundbite, the author says his people are depressed, obese and in poor health because breakfast is often “Pillsbury cinnamon rolls … Taco Bell for lunch, and McDonald’s for dinner.” Why is that? Is their gas turned off? Too lazy to cook? Much of the book reads like the dry narrative of a PhD thesis. Without even getting into the nutritional aspects, does a family who often eats out understand the costs of fast food? It takes too long for the author to tell us that many of the folks who came to Ohio for a better life found work in factories or mines and were thus able to join the middle class. There is also a long buildup to explain the present discontent and cultural divide. When he finally gets to the point, he tells us what we’ve been seeing and hearing for decades. Globalization and automation have been especially hard on the industries of “hillbilly people,” and they’re angry. They’ve lost their jobs; they’re financially strapped, depressed, increasingly obese, drug addicted, uneducated. Many of them place the blame on Democrats (though not Vance’s grandmother), immigrants and especially President Obama.